Three years after adoption, the Circular Economy Action Plan is fully completed. Its 54 actions have been delivered , even if the work on some of them continues beyond 2019. On 4 March 2019, the European Commission adopted a comprehensive report on the implementation of the Circular Economy Action Plan. The report presents the main achievements under the Action Plan and sketches out future challenges to shaping our economy and paving the way towards a climate-neutral, circular economy where pressure on natural and freshwater resources as well as ecosystems is minimised. The analysis served to, assess what extent EU policy tools addressing products are supporting circular, sustainable products. There are many policy tools covering all the different products on the EU market, and these tools together provide a great contribution to sustainability. They protect the environment and human health, make products more energy and resource efficient and empower consumers to choose better products. The analysis found there is potential for further strengthening the policies, especially as concerns the circular design of products such as textiles and furniture. Also, more could be done to support consumers and circular sectors such as reuse and repair. 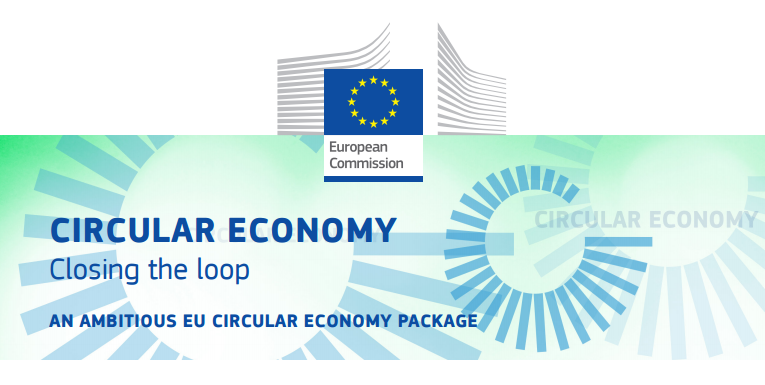 The package was presented during the 2019 edition of the Circular Economy Stakeholder Conference on 6-7 March, hosted by the European Commission and the European Economic and Social Committee. The recording of the web streaming is available in the European Circular Economy Stakeholder Platform. A Europe-wide EU Strategy for Plastics in the Circular Economy and annex to transform the way plastics and plastics products are designed, produced, used and recycled. By 2030, all plastics packaging should be recyclable. To achieve its ambitious vision, the Strategy foresees actions to improve the economics and quality of plastic recycling; to curb plastic waste and littering; to drive investments and innovation; and to harness global action. To reduce the leakage of plastics into the environment, the Commission has also adopted a new proposal on Port Reception Facilities, to tackle sea-based marine litter and published a report on the impact of the use of oxo-degradable plastic, including oxo-degradable plastic carrier bags, on the environment. A proposal for a Directive on the reduction of the impact of certain plastic products on the environment - implementation of the EU Strategy for Plastics in the Circular Economy. The Directive proposes different measures for specific items made of single use plastics taking into account the consumer behavior as well as consumer needs and opportunities for businesses. When alternatives are clearly available – both single use and multi-use ones – market restrictions are proposed. Other measures include appropriate labelling, awareness raising, voluntary actions, and the establishment of Extended Producer Responsibility schemes that would also cover the costs for the clean-up of litter. A proposal for a Regulation on minimum requirements for water reuse - the proposal is setting minimum requirement to boost the efficient, safe and cost-effective reuse of water for irrigation - deliverable of the Circular Economy Action Plan. The European Circular Economy Stakeholder Platform is a virtual open space which aims at promoting Europe's transition to a circular economy by facilitating policy dialogue among stakeholders and by disseminating activities, information, and good practices on the circular economy. Stakeholders can take part in the Platform by participating in the annual conference and by interacting on the website to look for good practices, to engage with other stakeholders and to share their own good practices and events. The members of the Coordination Group contribute to gather best practices on circular economy, to raise awareness about existing national, regional or local strategies, to identify challenges and opportunities for the transition to a circular economy among policy makers, businesses, trade unions, civil society, etc. In 2015, the European Commission adopted an ambitious Circular Economy Action Plan, which includes measures that will helpstimulate Europe's transition towards a circular economy, boost global competitiveness, foster sustainable economic growth and generate new jobs. The EU Action Plan for the Circular Economy establishes a concrete and ambitious programme of action, with measures covering the whole cycle: from production and consumption to waste management and the market for secondary raw materials and a revised legislative proposal on waste. The annex to the action plan sets out the timeline when the actions will be completed. The proposed actions will contribute to "closing the loop" of product lifecycles through greater recycling and re-use, and bring benefits for both the environment and the economy. The revised legislative framework on waste has entered into force in July 2018. It sets clear targets for reduction of waste and establish an ambitious and credible long-term path for waste management and recycling. Separate collection obligations are strengthened and extended to hazardous household waste (by end 2022), bio-waste (by end 2023), textiles (by end 2025). Minimum requirements are established for extended producer responsibility schemes to improve their governance and cost efficiency. Prevention objectives are significantly reinforced, in particular, requiring Member States to take specific measures to tackle food waste and marine litter as a contribution to achieve EU commitments to the UN SDGs. In December 2014, the Commission decided to withdraw its legislative proposal on waste, but the Commission committed at the same time to use its new horizontal working methods to present a new package by the end of 2015 which would cover the full economic cycle, not just waste reduction targets, drawing on the expertise of all the Commission's services. Work on resource efficiency and circular economy has profited inter alia from the reports and assessments of the International Resource Panel (IRP). More information on the role of the IRP and its relations with the European Commission can be found here. Circular Economy Missions - series of high-level political and business meetings in third countries to communicate and promote sustainable and resource-efficient policies.